After winning the last two versions of Rally Japan in 2007 and 2008, BP Ford Abu Dhabi World Rally Team returns to the Pacific Ocean island of Hokkaido next week intent on sealing a third consecutive win there. Rally Japan (9 - 12 September) takes the squad back to its preferred gravel roads, the team having won two of the last three loose-surface rallies with its Ford Focus RS World Rally Car. This 10th round of the FIA World Rally championship is the last of the 2010 season to journey outside Europe and returns to the series after a year's absence. Mikko Hirvonen and Jarmo Lehtinen climbed onto the top step of the podium in both 2007 and 2008 while team-mates Jari-Matti Latvala and Miikka Anttila are on form on gravel, having won in New Zealand and Finland recently. than 540,000 fans attending in 2008. The jewel in the rally's crown is the 43,000 capacity Sapporo Dome, a modern baseball and soccer stadium that hosted the 2002 World Cup. It will host a spectacular indoor super special stage on each day of the rally, over a course modified since 2008. The bulk of the competition is based on undulating, medium to fast gravel forest tracks, many of which are particularly loose. The rally is held seven weeks earlier than in 2008, so the cold weather and leaf-covered surface is likely to be replaced by drier roads and temperatures of around 25ºC. However, a strong likelihood of rain could make the tracks slippery and muddy. Hirvonen has started in Japan on five previous occasions and also has a third place to his credit in 2006. "I enjoyed the type of roads here in 2008. They were fast, flowing and quite sandy. The championship hasn't been there for two years so it will be interesting to see if any work has been carried out on the roads. If not, they could be quite soft and slippery if it rains. Although the rally is earlier in the year this season, I don't think it will make a big difference to the road surface," he said. "After crashing out in Finland so early, I'm short of recent gravel competition because the previous loose-surface rally was at the end of May. The shakedown in Japan is at Sapporo Dome so there is no opportunity to benefit from a final test on a proper gravel stage. It may take a while to get back into the rhythm again on the first stage, but it shouldn't be a problem. I should have the speed to fight for a win but my main target is to end the year with a series of strong finishes," said the 30-year-old Finn. This will be 25-year-old Latvala's fourth start in Japan, his best result in 2008 when he was runner-up to Hirvonen as Ford claimed a formation finish. "The stages are fast and although there are trees close to the road, visibility through the corners is good and the speeds remain high. 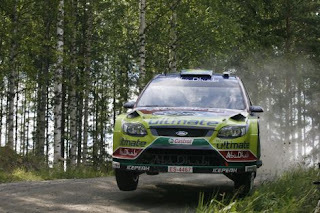 I prefer fast, flowing rallies like New Zealand and Finland. Japan is another rally of that nature although the roads are narrower here. "My confidence is highest on that type of road and I want to fight for a podium. I had good speed when I won in Finland in July and the Focus RS WRC is competitive in those conditions so I'm confident a top three finish is possible. "We have to use Pirelli's soft compound tyres and the warmer weather will make it more difficult for them. But the road surface is quite soft and sandy and the distances we must drive on the same set of tyres are not particularly long, so I have no worries about excessive wear," added Latvala. Abu Dhabi's Khalid Al Qassimi and Michael Orr will drive a third Focus RS WRC for the team. "This will be the first time I have competed in Japan, but I am looking forward to the return to a gravel surface and, with my eighth place finish in Germany, I am feeling confident to push for a top 10 finish to claim more championship points," said Al Qassimi. * Tyre partner Pirelli will provide BP Ford Abu Dhabi with one regulation tyre pattern. The Scorpion gravel tyre will be available in soft compound only, one of just three rounds in which soft gravel rubber is used. Teams are not allowed to hand-carve additional cuts into the rubber and each car can carry two spare wheels. S-WRC and three Ford Fiesta S2000 cars will start. Organisers have made significant changes, including a totally new final leg. While Sapporo Dome remains the location for the super special stage, the rally base and single service park have been moved to the nearby Tsukisamu Dome. The rally begins with two passes over the Sapporo Dome test on Thursday and these are repeated at the end of each leg, with the stage used eight times in total. The opening two legs journey south of Sapporo and close to Lake Shikotsuko for stages near the towns of Tomakomai, Chitose and Eniwa, which were all used in 2008. The final day heads north-east of the city for two loops of three new stages near the towns of Sunagawa, Bibai and Naie, taking the route further north than in 2008. Drivers tackle 26 stages covering 303.54km in a route of 1220.43km.